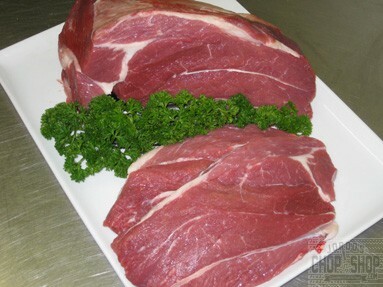 Swan Hill dry-aged fresh body grass-fed beef. Average 15-20mm steak weight is 200-300g. Buy bulk and SAVE! Boneless or bolar blade is a good all rounder. It can be used for kebabs, steaks, stir-frys, curries, casseroles and slow cookers and much more. We find it generally under-rated as a steak or kebab meat which makes it good value for these types of cooking. We usually still recommend cheaper cuts like Chuck, Gravy Beef and Osso-Bucco for slow cooking as they have a richer finish and are even better value. Jordo's tip - Heavily tenderise blade steaks (we can do this for you) and soak overnight in your choice of marinade, then cook on a flat BBQ plate then sit back and taste the magic. Jordo's tip #2 - Season a whole bolar (try our free pepper or mango chilli seasoning) and roast in a Webber or hooded BBQ. The Blade roasts top fat has a tendency to capture the smokey BBQ flavour and the thin piece of connective tissue that runs through the roast breaks down and liquifies which keeps the roast succulent on the inside.